The courts are being installed ! 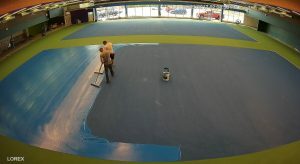 The surface will consist of 4 layers of Plexipave and will be completed by Wednesday. 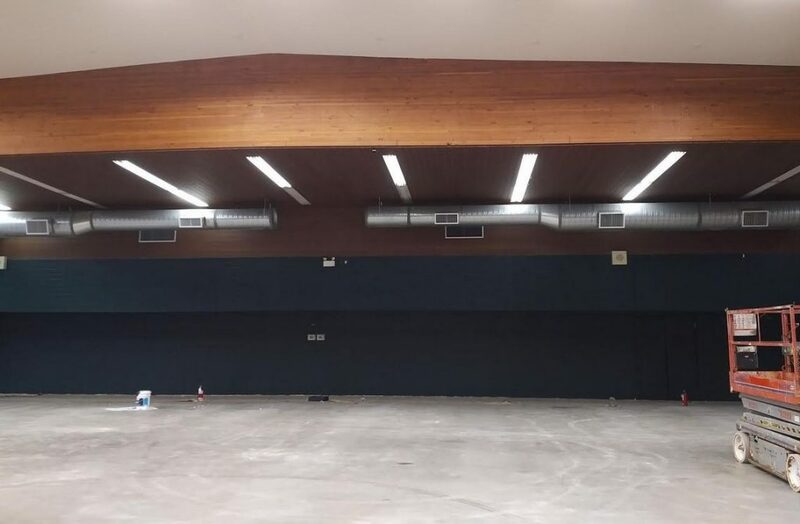 With most of the preparations complete, lights protection installed, ceiling repainted, bulbs replaced and the floor sanded courts installation crew arrives tomorrow. The second floor office removal will be completed today. 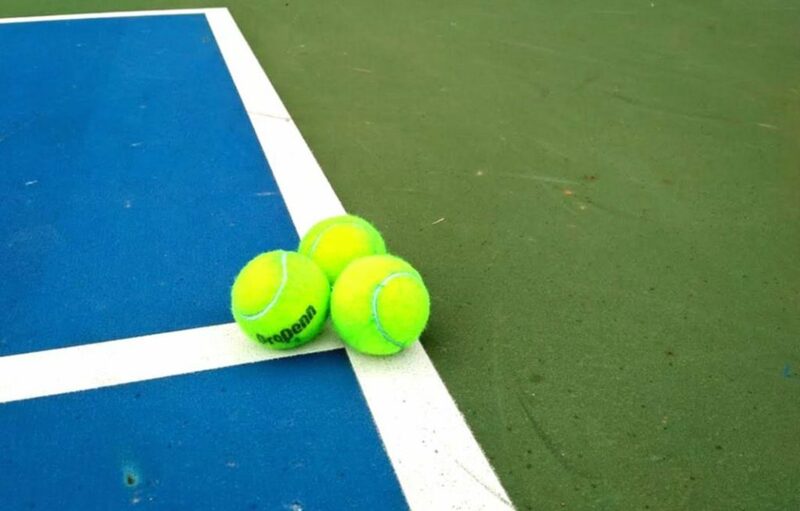 Tennis courts surface will be installed over this coming weekend – Oct 20th -22nd. Feel free do drop by to see how that is being done! We will not have separate change rooms ready for Nov 1st due to higher than expected office removal costs. There will be one single change room unless someone will contribute money, time or materials (or all together). If anyone is willing to volunteer and knows how to build framed walls and install doors etc please contact me at president@prtennis.ca. We need to install two drywalled partitions about 20 feet long each and two doors. We will be getting the separate change rooms done as soon as money will allow us. HVAC duct moved on one side, the other side to be completed tomorrow. The back walls painted in dark green. The surface is being sanded in preparation for the Plexipave and to be completed tomorrow. 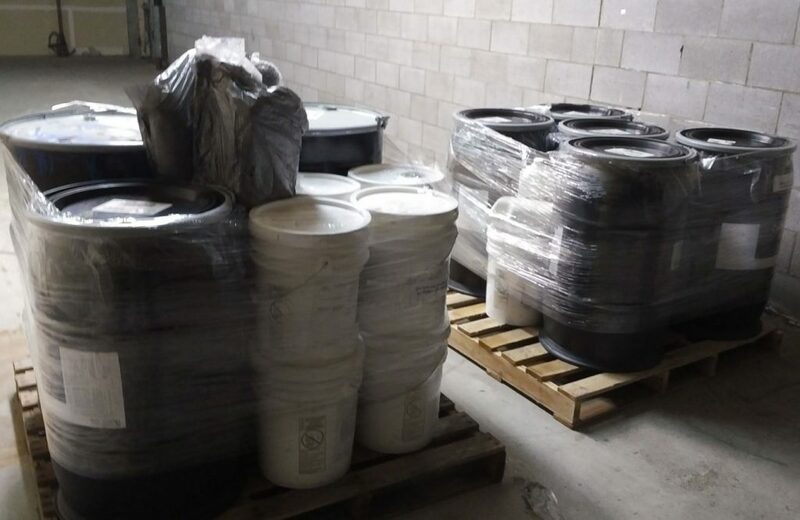 The surface compound has been received (two skids). The building sign has been traced and will be painted in the next day or two (hope the weather will help here). The lighting fixtures protection mesh is still being installed (about 60% complete). There are 48 6x pipes “High Output” fluorescent in the middle of the area plus there are 10x sets of 10 feet long “traditional” fluorescent behind the baselines… Quite a bit of work. Next week promises to be quite exciting as the courts installation scheduled for Oct 20th and the change rooms are to be built as well. The membership registration is now open! Please navigate to our Online Reservation System and follow “Create an Account” link to create an account and get access to the first blocks of lessons. All new account requests will be reviewed by the Center and once approved an email with the initial account credentials will be sent out. Please have a read of the Liabilities Waiver. We will be expecting you to sign a paper document once you receive a key (contactless fob) to the facility. Registrations for the lessons are available one month in advance and the court reservation will be opened 7 days in advance. Please let us know about any issues observed and we will do our best to fix them. One more milestone reached – the lease contract has been signed. We have the building on Oct 1st! Once the Facebook page was created we have had nothing but problems with it. It has been taken down, then our access to updates and posts has been disabled “while they are reviewing my photo “. While we are working this issue out we will keep updating this site and Twitter feed @PRTennisCentre as well. Mark up one pickeball court / tennis court and use the tennis net ? Please send your feedback via the form here or Facebook or Twitter though I can’t tell when Facebook will restore full access and I’ll be answering here. There was a question about the sign and lack of it on the building. Roller Derby group is still “owns” the place. We will have building access on Oct 1st and we submitted the sign permit to the City a few weeks back. Once we get the permit and once we have the building the sign will be one of the first things to be done. For now we use a mock-up sign for advertising and awareness. We promise to execute the sign as close to that as possible. Once again – anyone with experience with art of murals is welcome to join the party and help with advise and/or the actual work. The lessons are being put into the system in anticipation of Oct 2nd registration opening. So far all works as expected. That is all for now and thank you all for all support. A. We want the Powell River residents, visitors and their kids to have the same kind of opportunities as in the bigger cities. Q. Why do I have to play tennis? There is more people in the community who prefer other sports! A. Well, no one is forcing anyone to do anything. 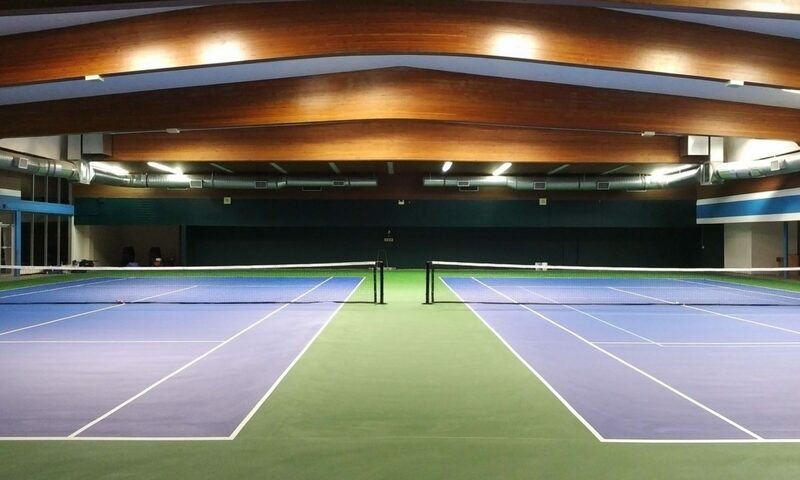 You will have a Tennis Centre in town where you can go at any time and play a game of tennis. You will be able to take tennis lessons and your kids can learn to play in the tournaments which could be as exciting as any other sport. For those interested we can do club tournaments and hitting sessions and lots of fun things. Q. When the registration for lessons, memberships and regular play will be opened? A. We are working hard to get all of it published on the Internet Oct 2nd. Starting Oct 2nd, the system will be opened for the account registrations. Once registered, you will be able to book lessons, courts and participate in other events. The renovations of the building and preparation for court surfacing will start at the same time. Q. Why are we seeking contributions and donations while we will be collecting memberships and hourly fees and charge for lessons etc etc. A. The more we get initially with contributions and may be some volunteered labor the less will be the cost of the services we provide. We would like to keep the costs low and affordable for Powell River. I think the last one needs some explanations. The initial investments to build tennis club infrastructure are quite high. We are striving to build a good place and we invest a substantial (by our measure) amount of money into it. For those concerned, there is no government or municipal grant money in this project. The tennis courts, nets, screens/curtain behind baselines are all necessary and the money is allocated for these items. Relocation of HVAC ducts which happened to be right above the baselines is one of these. We are doing it and we have money for it. This is one of the “very nice to have” thing. We will be doing lots of these things ourselves and we appreciate if someone gives us a hand. There are other things which would reduce the operational costs in the long run. Remotely-controlled power switch for lighting is one of these. Right now the lights are controlled by the breakers and there is no master switch. This one will be installed only if we get enough money from your contributions. The next big item on the list is the proper change rooms with showers. we will move forward as soon as money permit and will add two separate washrooms and shower/changeroom area upstairs. The contribution will allow us to get it in sooner. And yes, there is rent/utilities/taxes/accountant/cleaning and maintenance and unavoidably some repairs. We are starting renovations on October 2nd with relocation of the HVAC ducts. The freshly discovered roof leak has been promptly fixed by Nelson Roofing. There will be some drywall replacement on the inside but that seem to be fairly minor. With the leak and other activities planned we decided to move the court installation to the week of October 16th which still gives plenty of time to have it properly dried for Nov 1st Grand Opening. The sign permit and the business license applications to the City of Powell River have already been submitted. 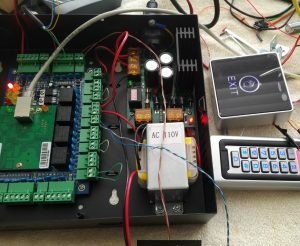 The components of the door access system have arrived and have been tested working. Both the card access for members and PIN access for guests have been proven to work as designed.